Only seven of the Second Doctor's twenty-one adventures have completely survived. 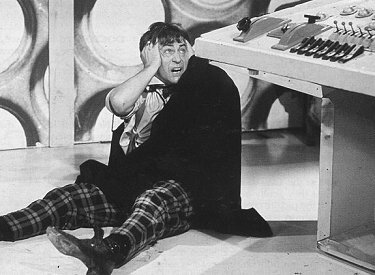 Most of them are only missing a few episodes but a couple of them, like The Power of the Daleks, are completely lost*. Even without the original video footage, it's clear that the Second Doctor is a force to be reckoned with and a worthy successor to the First Doctor. Though he refuses to directly answer any questions asked of him and hesitates to confirm that he is, in fact, the Doctor, he is immediately captivating and in control. After his regeneration (or "renewal," they wouldn't use that term until the Third Doctor became the Fourth Doctor), the Doctor picks up a recorder and a stove pipe hat and then walks straight into a murder mystery. The Doctor assumes the identity of the murdered man and waltzes into the middle of a power struggle going on among the colonists of the planet Vulcan (no, not that one). Things only get worse after the colonists revive some Daleks that were found in a space capsule that had crash landed on their planet. The colonists get so wrapped up in their individual quests for power that they willingly overlook the fact that the Daleks are capable of deadly force. Everyone is so thoroughly convinced that the Daleks are the solution to all their problems, the Doctor's warnings of impending death fall on deaf ears. There's a great moment in the second episode when the mad scientist character reveals a revived Dalek to his superiors. The excited colonists drown out the Doctor's warnings with grand plans for their new mechanical assistant and the Dalek, seeing an opportunity to seize power, announces, "I am your servant." The Daleks have shown, time and time again, that they are capable of brutal and overwhelming force but this is truly the first time that we have seen how clever they can be. *Audio recordings of each episode have survived along with a few short video clips. There are a number of fan recreations of these episodes floating around the internet, if you're interested. Though recently, the BBC announced that they have put together an animated recreation of this serial, using the original audio, which they plan to release this fall commemorating the 50th anniversary of the serial's original broadcast.